You knew this was coming, right? Crazy cat lady that I am. But truly, how can you not love whiskers on kittens? Definitely one of my favorite things! Winnie’s whiskers are one of the first things people mention when they see her. They are indeed long and luxurious, almost wavy, which is ironic because when we first adopted her she had noticeably fewer whiskers and many of the whiskers she did have were shorter than normal with blunt ends, almost as though they’d been cut. Thankfully, Winslow’s whiskers are now her pride and joy. 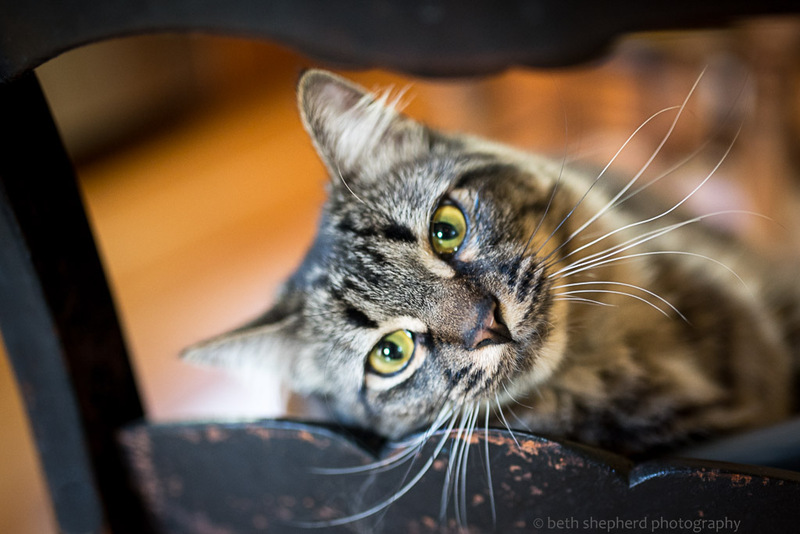 Wally (Wallingford) has fine whiskers that curve in an arc. He has a fair number of them but they are fine and super soft like the rest of him. He is the sweetest big lug of a cat. Miss Maggie (Magnolia) had the most amazing eyes, round and clear, at times blue or green. They were the first thing that people would comment on (second to her sweet disposition). Her whiskers were numerous and quite bold. The staccato to her otherwise gentle personality. Mr. Madison (Maddy) was the “Pig-Pen” of cats. He always had a layer of fluff and dander floating a few millimeters off his fur. If you look closely at his whiskers you can see a piece of fluff, on the left, hanging on for dear life. 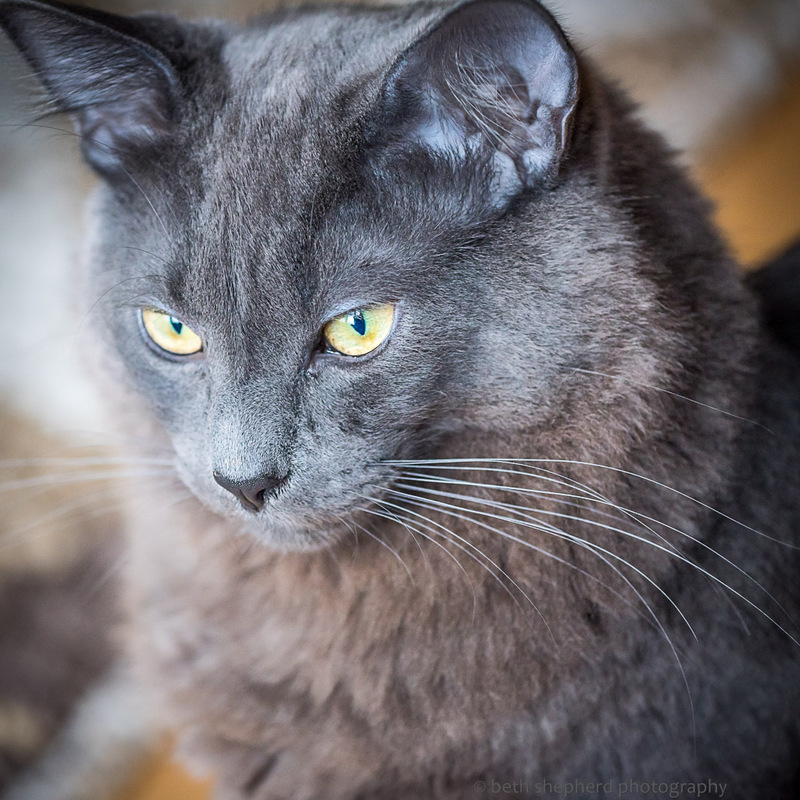 He was my first cat, super smart, quirky and a great companion. 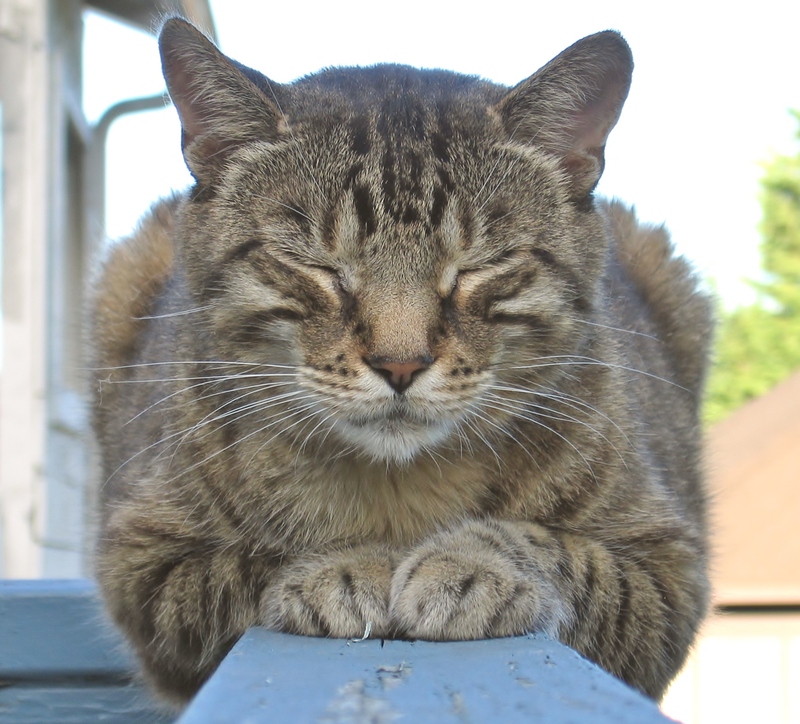 I love this photo Joel took of him “meditating” on our old porch railing. I sure love my cats. They’ve seen me through a lot. It’s hard for me to imagine life without a cat or two. 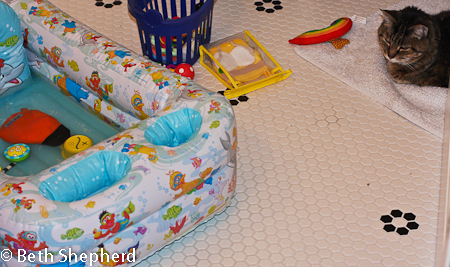 And next thing you know, there are two kittens living in our home! I have not been mama to a wee kitten in 20 years, but our home felt empty without Maggie (and Madison, who left us five years ago) and so I decided it was time. 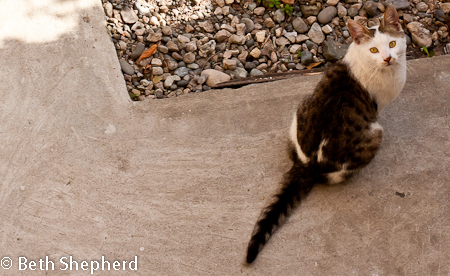 I intended to get one cat, not a kitten, and tailless (both my previous cats were Manx cats). Searching online for “the one,” reminded me of internet dating. 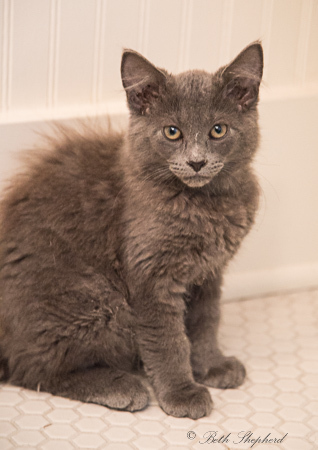 I made my list of contenders and visited several shelters over the course of a few days, trying to imagine this cat or that cat joining our family at The Urban Cabin. None of them felt like the right fit. On a visit to PAWS Cat City to meet an older cat I’d read about online, I spied a tiny tabby out of the corner of my eye. “Tell me about her,” I asked the shelter volunteer. When I went into the room where she was, and sat down to play with her, I saw this handsome gray face staring back at me from inside a cubby. A few hours later after consulting with Big Papa, I returned to Cat City, kitty carriers in hand. By 6:00 our family had two new furry members. 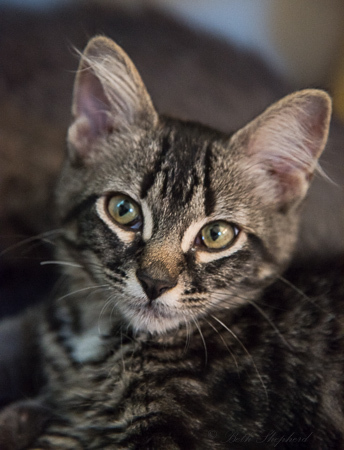 The tabby has been named Winslow (nickname Winnie) after the city on Bainbridge Island where Big Papa and I traveled by ferry on our first date. The gray kitty is Wallingford (nickname Wally), after a neighborhood where Big Papa lived for awhile. My previous cats were also named after Seattle neighborhoods: Magnolia, or Maggie, and Madison, or Maddy. 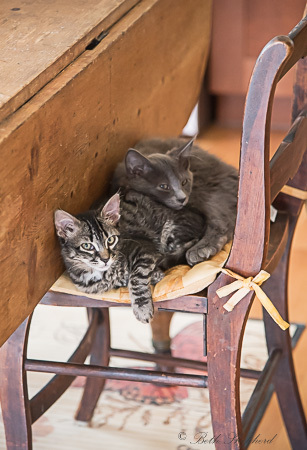 Four days in, it’s been–and will continue to be–a new chapter, getting two know these two cute-as-the-dickens feline friends. Both have been a bit under the weather (respiratory cat crud common in shelter cats) but I’m hoping they will recover soon and we’ll enjoy many, many years together. Yes, this is another post about my cat, Maggie. She turned 20 last week which meant a celebration was in order. 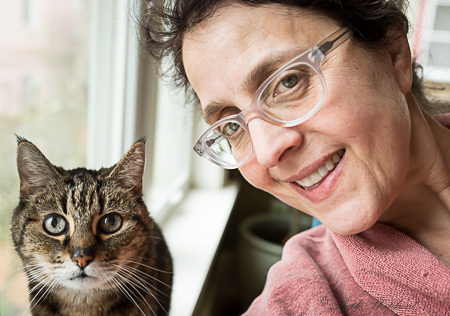 Her longevity–and my love for her–got me thinking about cats (and dogs, fish, hamsters…) in the U.S. versus other countries around the world. That my sweet girl made it to 20 is in part due to the luck of genetics, but I am also certain the extent to which we pamper our pets in the U.S. goes a long way towards keeping them healthy and happy. When I travel, I am conscious of the fact that some countries are pet friendly while others are not. When I’ve visited Amsterdam, cats are everywhere, on the street (but not looking homeless), and hanging out in windows. 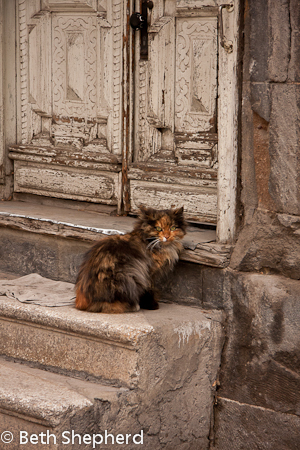 However, when I’ve visited Armenia, I mostly see feral cats and packs of wild dogs. On rare occasions I’ve seen a pet dog out for a walk on a leash. I did a little research on the prevalence of pets, especially cats and dogs, around the globe, and was surprised to learn that China ranks number two, after the U.S. for the country with the most pet cats. I was equally surprised (shocked, actually) to discover that the Swiss–who do rank high in pet ownership–are under a lot of pressure to stop eating cats and dogs. I must tell Maggie to take the Swiss alps off her travel bucket list. Even in the U.S., some states have more “cat people” whereas other states have more “dog people.” Apparently the west coast leans in the cat direction. For countries saddled with economic challenges, pets are an additional burden–another mouth to feed. 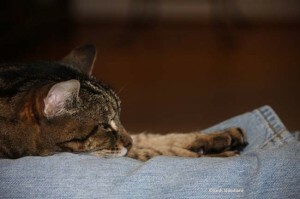 Having pets who can live out a life of leisure is most definitely an indication of wealth and prosperity. Right now, as I look into our yard, I see Maggie sitting in the garden under the espalier apple trees, licking her paws. Bliss. Earlier today, she was snoozing beside the tomato plants. 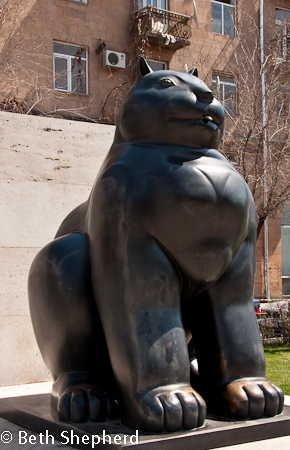 Every day she’s still with us, I say a little thank you to Bastet, the cat goddess. I’m grateful I live in a country where we have both the desire and the means to share our homes with our beloved pets. Got a fever? Need more cowbell? 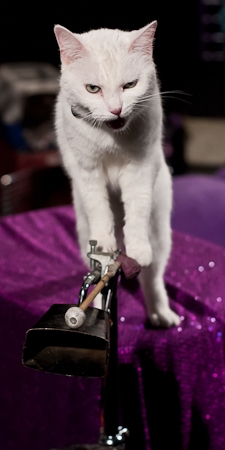 Go see Acro-cats! 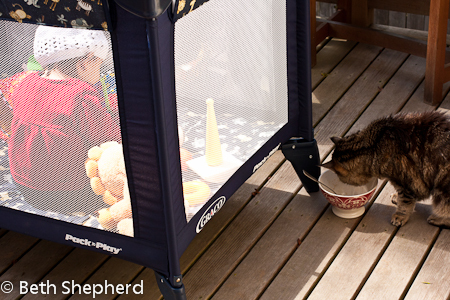 Cats jumping through hoops, ringing a school bell, pushing shopping carts? 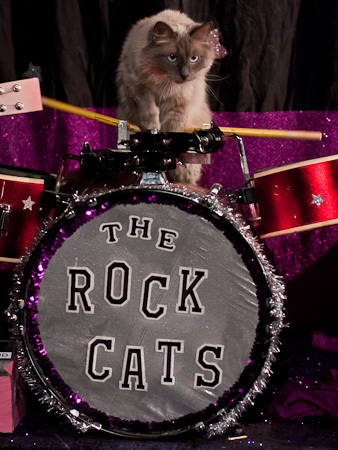 Cats playing in a rock band? YOU BETCHA! 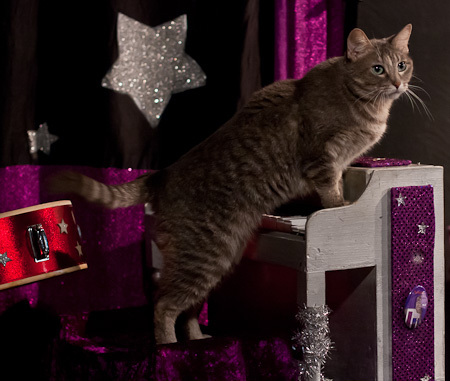 We saw all that and then some at the stellar performance of the Acro-cats and the Rock Cat Band. We yowled, we hissed, and we meowed at the purrfectly amazing felines on stage in front of us. 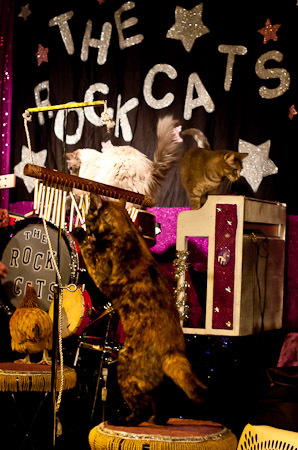 The highlight was the Rock Cat Band with a drummer, a keyboard player, a cat on bells, a chicken on tamborine and “Tuna” on cowbell. 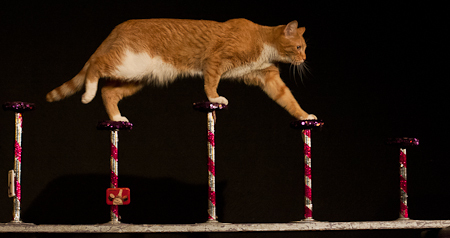 Acro-cats is entertaining for young and old alike. Two moms with children under three sat next to us and their kids were riveted throughout the entire hour-and-a-half show. 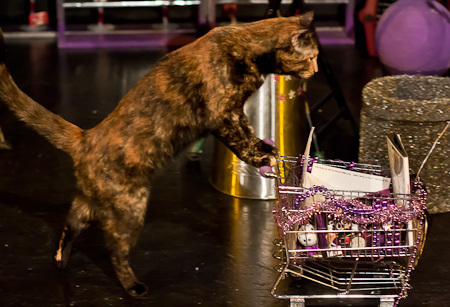 Go see Acro-cats at Seattle’s Stone Soup Theater through September 1st. Give ’em a scritch and show them some love! Want to see more cowbell? Check out Delicious Baby Photo Friday! We love kittens. And cats. 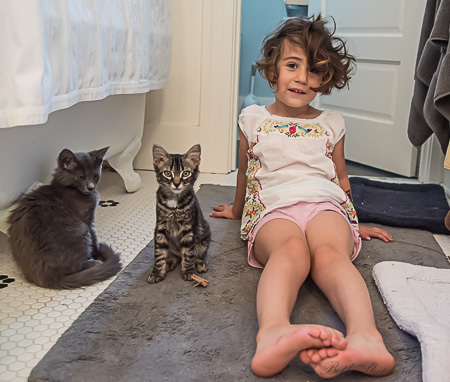 Of course we hoped our daughter would also love kittens and cats….and one cat in particular: ours. 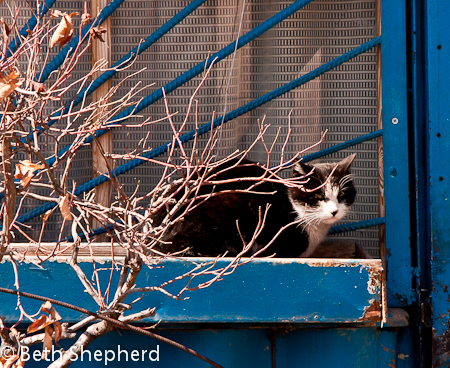 So when we were in Armenia, we started Kittenwatch 2012. Every day, everywhere we went, we looked for kittens. And cats. We saw a lot of kittens and cats. We pointed them out. We ooh’d and ah’d. We watched them closely. And then we came home. And watched our own. 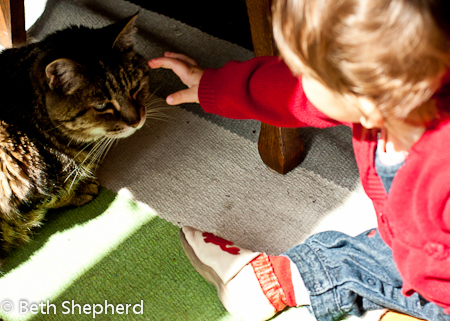 Want to purr about more great photos? Check out Delicious Baby Photo Friday! For a solid decade I felt pretty certain I’d evolve into one of those crazy cat ladies you hear about in the news, just me and my two sweet cats for ever more. A number of guys I dated during that period either didn’t like cats or were allergic to cats. 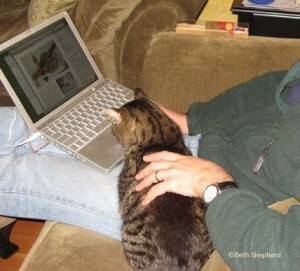 One I nicknamed ‘Allergic Guy.’ He was allergic to all sorts of things, including cats. Three weeks into dating he said, “You’ll need to make a decision soon about the cats.” Decision made. Cats stayed. Allergic Guy didn’t. several extra Brownie points right on the spot. Sadly, she passed away suddenly and unexpectedly three weeks into our relationship. We buried Cleo together in the backyard and planted a lovely Bleeding Heart plant where she lies. After we’d dated a couple months, I started to bring my cats over for “weekend camping” at the Urban Cabin. I’d pack up their cat food, medicine (one was diabetic and the other has a digestive tract ailment), stick the cats in the kitty carrier and off we went. Mr. Madison took to the adventure right away. For one, the Urban Cabin has a fenced backyard. 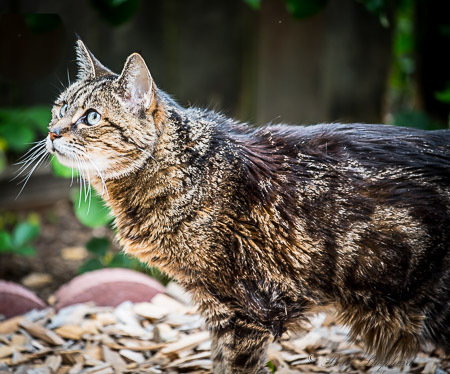 Maddie loved the outdoors and hadn’t been able to enjoy it for the decade we were in my apartment on a busy street. The first weekend I brought him over, we opened the back door. Out he went and out he stayed for most of the weekend. He gave the paws up signal on the yard and Big Papa pretty quickly. Miss Magnolia was another story. She spent the first weekend under the bed, clearly disturbed, emerging only at night to meow loudly back and forth through the rooms like a ghost clanking its chains in the silence of a haunted house. 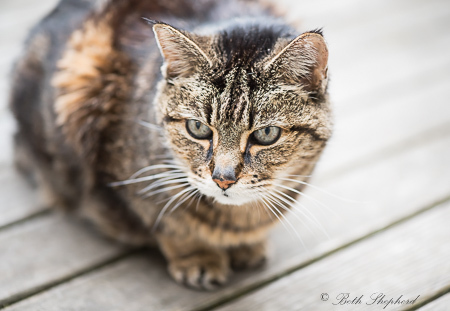 The outdoors held many unknown terrors for Maggie and, when she did go out, she usually retreated to the perceived safety of a bush or hid under the deck. Both Madison and Maggie took immediately to Big Papa. I knew Big Papa was a keeper when, on their first night over, Maddie crawled under the covers and set up camp lodged snugly between us. It didn’t seem to throw Big Papa and I thought it was a magnanimous act on his part. Madison always called first dibs on Big Papa’s office chair. If Big Papa stood up for even just a moment, Maddie was there in a flash. 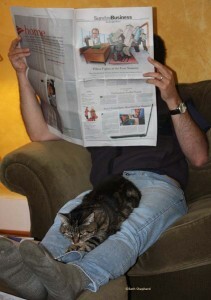 In the morning, they’d check email, Maddie draped languidly over Big Papa’s arms in the living room chair. He’d follow Big Papa around in the garden, stopping here and there to check out a plant. 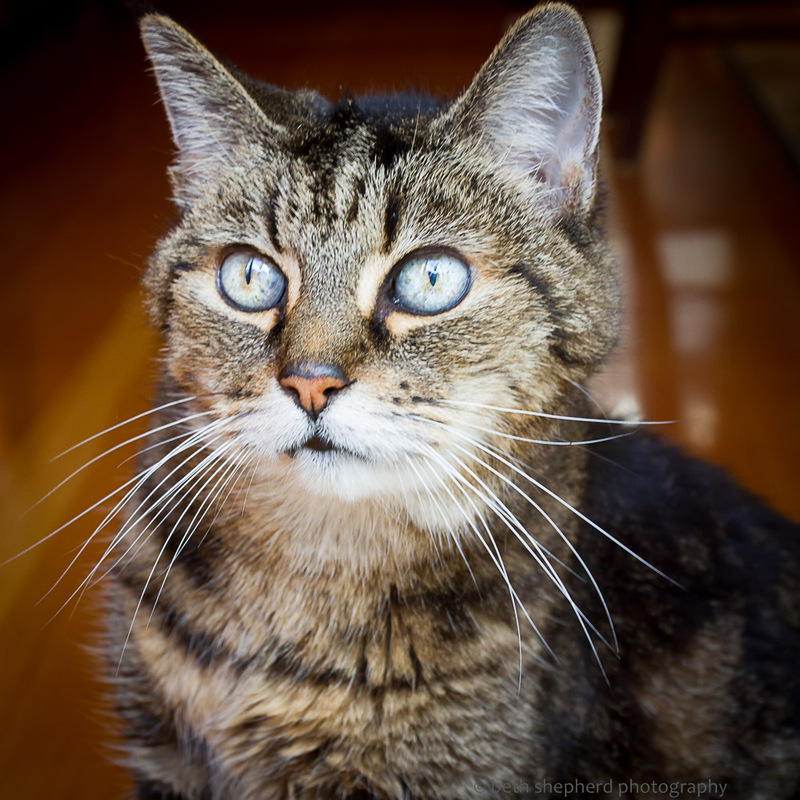 When Madison passed away at the ripe old age of nearly eighteen, I was devastated. Big Papa was at my side and took the day off to console me. Madison had been my buddy for nearly a third of my life. I miss him dearly and Big Papa and I still wonder WWMD (What Would Madison Do) when certain scenarios crop up in our lives. Over time, Maggie grew more comfortable the house and the backyard. After Madison died, she acquired rule of the roost, and really seemed to come into her own at the ripe old age of thirteen. She too looks to Big Papa for comfort. He’s a talented head scritcher and a suitable Barcalounger when she wants to watch a movie or snooze at night. She seems to love nothing more than to stretch to her greatest length along Big Papa’s legs. Big Papa’s roll with it ease and generosity of spirit are two of the traits I fell in love with. He’s takes good care of us. We eat great food and fall to sleep with the Urban Cabin’s cozy roof over our heads. These are just a few of the reasons I know he’ll be a heckuva Dad when the time comes. Mr. Madison, Miss Magnolia and I were a lucky trio, to be sure, when Big Papa came into our lives.